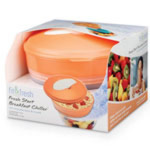 The Fit & Fresh Soup & Salad container is just what you need for hearty and healthy winter lunches. 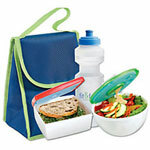 This handy lunch kit has a insulated bowl on top that keeps soup hot for hours. The soup bowl's cover screws on tightly creating a vacuum seal to ensure contents stay warm. Below is another compartment that holds a cold, crisp salad for up to 6 hours. Between the two compartments is an ice ring that keeps the salad and dressing cool. A twist & turn dispenser keeps the salad dressing separate until you're ready for lunch. 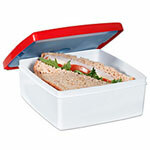 What better way to carry a nutritious lunch to school, work or wherever! Item is microwave safe and top rack dishwasher safe except for the ice pack. The soup container holds up to 12 fl. oz. of soup and the salad container holds up to 2 cups of salad and 2 tbsp of salad dressing. 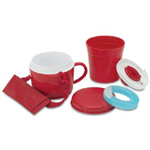 Includes a carrying strap with a utensil pouch. 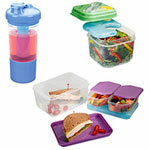 This plastic lunch kit is great for portion control as well as safe food storage. What a great idea for lunch!